Screen shot: Part of a letter from the Minnesota Department of Commerce to the state Public Utilities Commission. BULLETIN: The Minnesota Department of Commerce has asked the state Public Utilities Commission to deny TelexFree’s authorization to provide long-distance service in the state. Minnesota regulators now are questioning whether TelexFree financial and background information submitted to the state to gain telecom authority was accurate. The PUC granted the authority on April 18, after the Department of Commerce recommended approval of the application. The move comes on the heels of TelexFree’s April 13 bankruptcy filing in Nevada and fraud charges filed against the firm on April 15 by the Massachusetts Securities Division and the U.S. Securities and Exchange Commission. 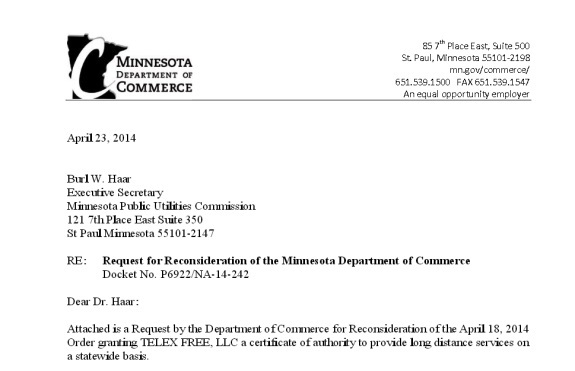 In the letter and attachment from the Department of Commerce, the agency asked the PUC to question whether TelexFree was in any financial position to provide service in Minnesota and whether “any other factors” exisited that could be relevant in determining its suitability to operate in the state. Among the considerations in granting a telecom license is “the extent to which the applicant has had any civil, criminal, or administrative action taken against it in connection with the applicant’s provision of telecommunications services,” the Department advised the PUC. “A certificate to provide local facilities-based service must not be granted unless the applicant establishes that it has the financial, technical, and managerial capability to provide the services described in its petition consistent with the public interest,” the Department said. The allegedly misleading information provided in TELEX FREE’s application relate to the basic filing requirements of Minn. Rules pts. 7812.0300, subpt. 2 (E, F, and N): civil and administrative action pending, financial statements, and information relating to the technical, managerial and financial capabilities of TELEX FREE in support of its application for certification. The allegedly misleading information in the TELEX FREE’s application relate to the decision criteria in Minn. Rules pt. 7812.0300, subpt. 2 (C, D, and H). If the Department had known this information, it would not have recommended approval of the application for certification to provide long distance service, without further investigation. TelexFree LLC was the entity granted authority to operate in Minnesota on April 18. Tracy Hope Davis, the trustee, also alleged there are “reasonable grounds” to believe that “criminal conduct” occurred at TelexFree. Challenges to its authority to provide telecom services could affect TelexFree’s ability to persuade a bankruptcy judge that it could continue as a going concern. Litigation against TelexFree is occurring at both the state and federal levels, and the firm also might face the prospect of class-action lawsuits from its distributors. The Massachusetts Securities Division alleged on April 15 that information provided investigators in that state did not agree with information provided the Washington State Utilities and Transportation Commission. In Nevada, meanwhile, Attorney General Catherine Cortez Masto has posted a notice to intervene in TelexFree-related matters before that state’s Public Utilities Commission. Records in Nevada show that TelexFree’s pending telecom application in the state potentially could be denied for failure to advertise its application in newspapers as required by the state. Although ads did appear in two newspapers, they did not appear as required in three others, records show. Not to mention that 90% of all Boston and Florida TelexFree promoters are allegedly visa overstayers and illegal immigrants.